Swordfish + Concubine, two famous Malay folktales come to life on stage! Remember the famous Malay legend, “Singapura dilanggar todak”? 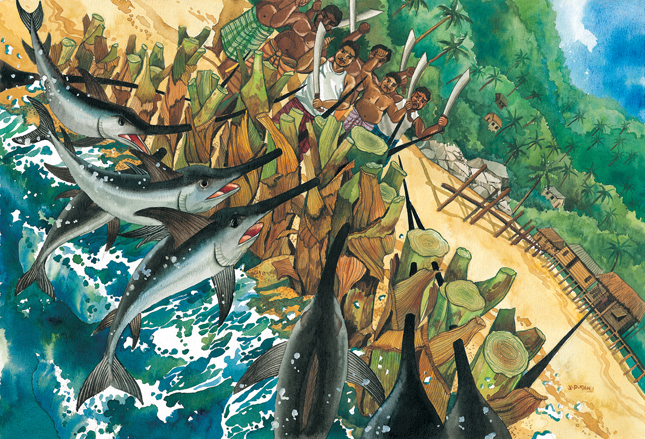 For those who don’t, The Attack of the Swordfish is a famous Malay folk tale about a little boy who found an ingenious plan to stop swordfishes from attacking the island of Singapore a long, long time ago. Using banana stems as fence, the boy became an overnight sensation among the villagers, much to the king’s annoyance. Fearing that the boy posed as a threat as he would one day grow up to become an intelligent person, the kind ordered him to be killed. Hana Nadira and Gregory Sze face off. It definitely does! According to Swordfish+Concubine director, Kee Thuan Chye, his adaptation of the two famous Malay folktales based off the Sejarah Melayu is extremely relatable. “Although the setting is supposed to be in the past, the play is about us today,” Kee says, adding that he is back after an absence of more than two decades. There has been various adaptations of his play mainly in Chinese, but this time around Kee is set to showcase his play in its original version, English. Bella Rahim and Iefiz Alaudin play the comic characters in the play. They rap and dance hip hop. This was the very same play which was judged as one of the top five in the International Playwriting Festival 2006 organised in the United Kingdom. For Kee, it is a dream he has been harbouring for eleven years to see it on stage. Possessing numerous political references, the focus of the play is on the central concern of a covenant made between rulers and subjects that is obviously lopsided. Joel runs as Iefiz Alaudin comes after him while Hana Nadira and Alfred Loh look on aniously. What makes Kee’s adaptation interesting is the fact that the manner in which these two stories are told; intense and yet fun filled. “The play draws inspiration from East and West, from Bangsawan to Brecht, from Wayang Kulit to Tarantino, from Dikir Barat to Zapin and finally to contemporary dance,” Kee adds. Amanda Ang tries to pacify a terrified Gregory Sze. The play has something for every Malaysian; drama, comedy, song, dance, rap, hip hop and even silat! What makes Swordfish+Concubine equally amazing are the number of stellar cast who Kee managed to rope in. Touting it as a “dream cast” the casts are; Na’a Murad, Sandra Sodhy, Qahar Aqilah, Alfred Loh, Hana Nadira, Arief Hamizan, Amanda Ang, Bella Rahim, Gregory Sze, Iefiz Alaudin, Lam Ghooi Ket and 12-year-old Joel Timothy Low who has been in numerous previous productions. Underscoring the drama on stage is live gamelan music, performed by the fabulous Rhythm in Bronze. “You’ll get to see gamelan meet hip hop,” Kee quips, adding that the play’s set, lighting, costume design and its choreography are the result of the creativity of award-winners. What makes this production equally amazing is the fact that the play is being staged in aid of charity for the family of former RTM Orchestra conductor, Ooi Eow Jin. Kee explained that the 80-year-old is suffering from Alzheimer’s. “What makes things alot more difficult is his son who is incapacitated by brain tumour,” he says, revealing that parts of the profit from the play will go to Ooi’s family. Swordfish+Concubine opens tomorrow at 8.30pm and runs until 5 November at Pentas 1, The Kuala Lumpur Performing Arts Centre. Ticket prices are RM95, RM75 and RM45 (for students and disabled). To purchase tickets online click here or call 03 4047 9000! PreviousWhat does it take to be Art Battle Malaysia’s champion?